Last time I wanted to share a personal achievement with you guys I wrote a post sharing my excitement after publishing my first iPhone Application. Unfortunately, judging from your reactions – that didn’t’ turn out so well ;). I want to introduce my second app today, but being smarter this time – let me show you an illusion first! After all, this is what you came here for in the first place, right? 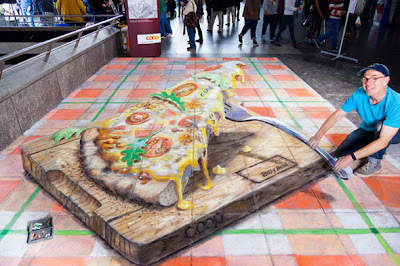 Let’s see what Julian Beever has been up to lately. His latest drawing was done in Zurich, depicting a giant 3D pizza. Like it?